After decades of environmental abuse from unregulated coal mining activities, impacted citizens from across the country fought hard for the passage of the Surface Mining Control and Reclamation Act (SMCRA) in 1977 to better regulate coal mining. In 1987, ten years after the passage of SMCRA, 200 groups and individuals came together and realized that SMCRA wasn’t being enforced. Two years later, seven groups founded Citizens Coal Council (CCC) to protect people, land, and water from the harm caused by coal mining. 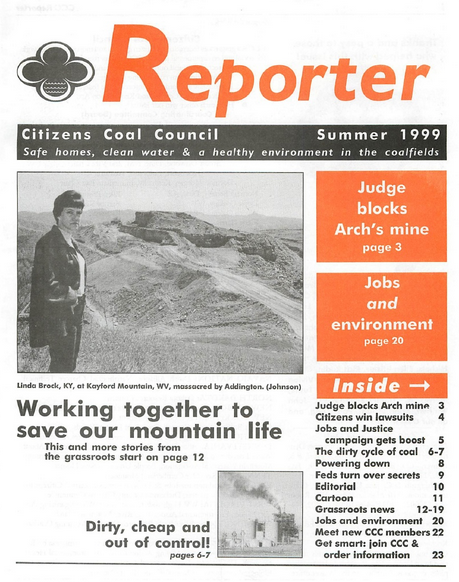 CCC addresses the core problems in the coalfields: the unequal distribution of power between the coal industry and citizens, an imbalance used by the industry to severely degrade the environment and deny citizen rights. 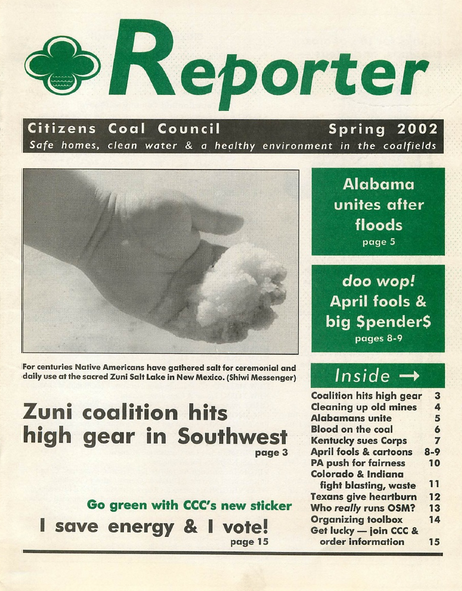 Fall 1995 Citizens Coal Council "Reporter"
Spring 1998 Citizens Coal Council "Reporter"
Spring 2002 Citizens Coal Council "Reporter"
Spring 1997 Citizens Coal Council "Reporter"
Winter 1998 Citizens Coal Council "Reporter"
Winter 2003 Citizens Coal Council "The Citizen"
Spring 1996 Citizens Coal Council "Reporter"
Summer 1999 Citizens Coal Council "Reporter"
Fall 1996 Citizens Coal Council "Reporter"
Spring 2000 Citizens Coal Council "Reporter"
Summer 1997 Citizens Coal Council "Reporter"
Summer 2001 Citizens Coal Council "Reporter"